More interesting ones to come in Part 6!…. Tombstone appearance in coagulative necrosis (source) Tombstone appearance of cells in coagulative necrosis. This is the hallmark of coagulative necrosis. The outlines of the cells are retained, but the cytoplasmic and nuclear details are lost..i.e the conversion of normal cells into their tombstones. The cell outline and tissue architecture is retained. 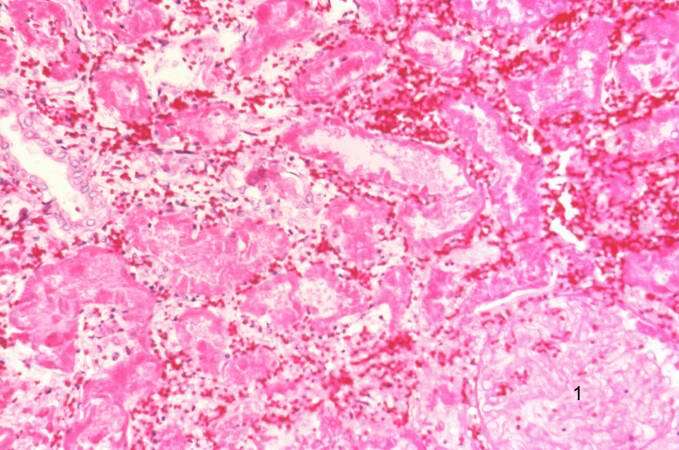 Spleen in miliary tuberculosis ( source ) Miliary tuberculosis: dissemination of the m tuberculosis bacilli in the blood therby resulting in miliay tubercles in various organs of the body. These tiny spots in various organs appear similar to millet seeds and hence the term “miliary” . 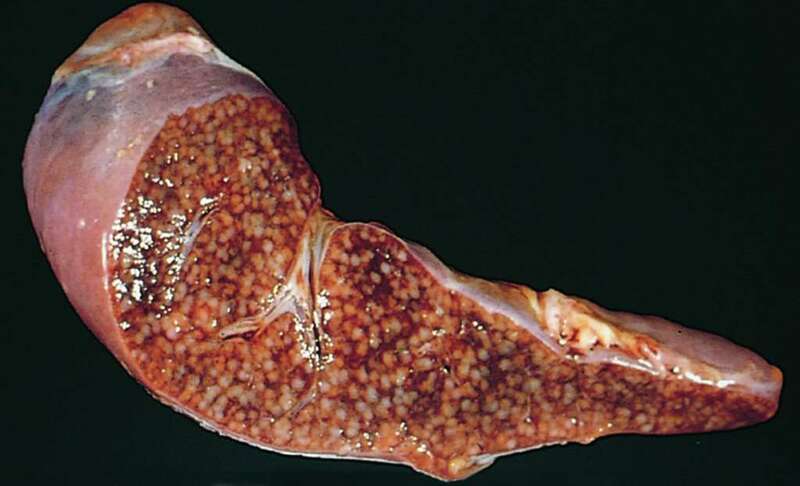 Crescentic Gloimerulonephritis/Rapidly progessive glomerulonephritis. ( Source ) Crescentic Gloimerulonephritis/Rapidly progessive glomerulonephritis.This is a glomerular disease characterized by formation of glomerular crescents. 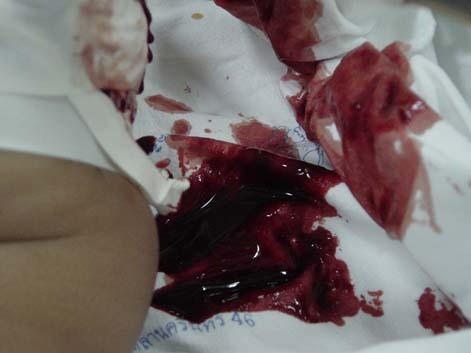 These crescents are the morphological manifestation of severe glomerular injury. Crescents are two or more layers of proliferating cells present in the Bowman’s space. Napkin ring constriction of distal colon carcinoma. ( Source ) Napkin ring constriction of distal colon carcinoma. The word Napkin ring is used to describe a constricting lesion of the lumen of colon, usually distal colon, by an encircling mass. This results in stricture or stenosis of the colon. These tumors are more infiltrative in nature. The normal red blood cells looks like donuts ( Source ) Donut. The normal red blood cells looks like donuts when observed under microscope. This is because of their biconcave shape.The biconcave shape is important for its increased surface area and flexibility and helps in sqeeezing through the smallest capillaries for delivery of oxygen from the lungs to body tissues. Red currant Jelly stool ( Source ) Red currant jelly” stool Stool mixed with blood and mucus seen in cases of intussusception ,more commonly in children. fire-flare appearance Source Fire-flare appearance or Marginal vacuoles (MVs) is a distinctive feature of thyrotoxic goiter in hyperthyroidism, in in May-Grünwald Giemsa stained fine needle aspiration (FNA) smearsThe Fire flares represent the diffusing out of thyroid hormones (T(3) and T(4)) from the basal aspect of follicular cells on their way to interfollicular capillaries. 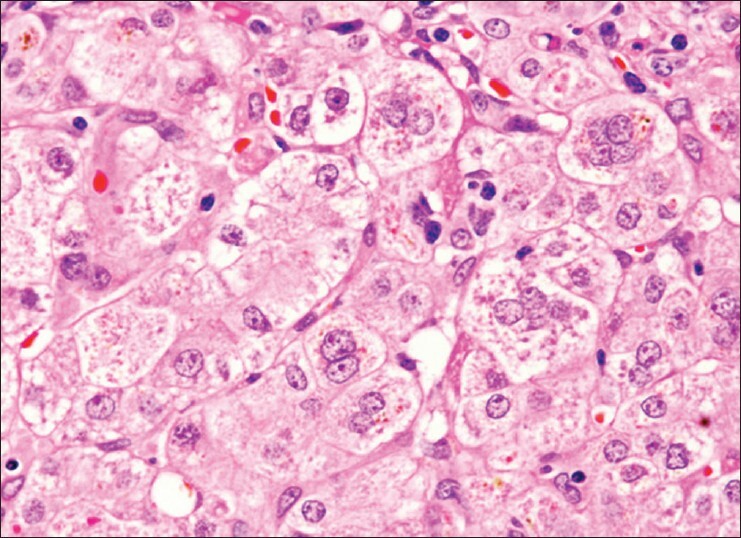 Balooning degeneration of hepatocytes (Source) Balooning degeneration of hepatocytes.These are large degenerated cells with pale staining and vacuolated cytoplasm. Balloon cell changes of epidermal cells in herpes zoster. Baloon cell nevus: these are nevus cells with vacuolar degeneration of melanosomes.